to filter his collection based on what keys are compatible with each other. In this way, Henderson is able to keep his audiences hyped and energetic. “I also have a color coding system and a rating system for energy level and vibe — it’s kind of nerdy, but that’s what I do,” Henderson says. 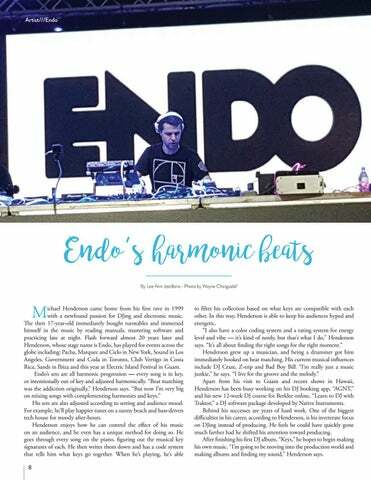 “It’s all about finding the right songs for the right moment.” Henderson grew up a musician, and being a drummer got him immediately hooked on beat matching. His current musical influences include DJ Craze, Z-trip and Bad Boy Bill. “I’m really just a music junkie,” he says. “I live for the groove and the melody.” Apart from his visit to Guam and recent shows in Hawaii, Henderson has been busy working on his DJ booking app, “AGNT,” and his new 12-week DJ course for Berklee online, “Learn to DJ with Traktor,” a DJ software package developed by Native Instruments. Behind his successes are years of hard work. One of the biggest difficulties in his career, according to Henderson, is his inveterate focus on DJing instead of producing. He feels he could have quickly gone much farther had he shifted his attention toward producing. After finishing his first DJ album, “Keys,” he hopes to begin making his own music. “I’m going to be moving into the production world and making albums and finding my sound,” Henderson says.